Düsseldorf has the largest number of Japanese people in the whole of Germany, and the 3rd largest population in Europe. This is because there are so many Japanese companies based in the city and their employees and families live and work there. 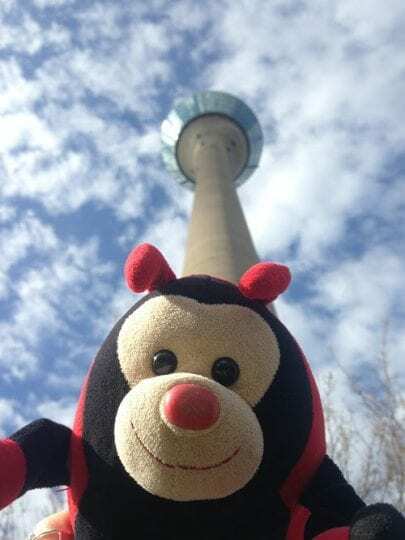 Travel Bug’s human Dad is Chinese, so he’s seen a lot of China towns on his adventures. This is his first time in a Japan Town, so he was very excited. He had bubble tea and sushi. Düsseldorf residents have, on average, good levels of pay, making it one of the highest ranking cities in Europe. It was also voted the 6th best city in the world in to live in back in 2012. Legend has it that children in Dusseldorf celebrated the city’s victory in the Battle of Worringen back in the day by doing cartwheels and now it’s a popular past time. Dusseldorf has statues of cartwheeling humans and cartwheeling cartoon figures, but not a single cartwheeling bug. Travel Bug knows this is mainly because bugs have pretty short arms and they can’t actually do cartwheels. TTB might still come back to the city for the annual cartwheeling competition, just to see how it’s done. Do you have any other fascinating facts about Dusseldorf to share with the Travel Bug?